Two of visionary architect's classic homes still hang on the market—for eight figures! 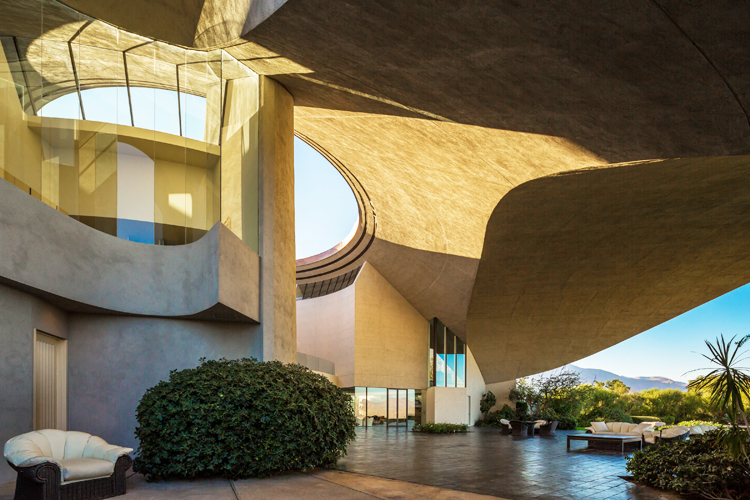 Architect supreme John Lautner has never been one to inspire ambivalence—but why are two of his houses (including the Bob House house here) not moving? Photos: courtesy Patrick-Stewart. More views of the Hope house. Overpriced curiosities or undervalued works of art? 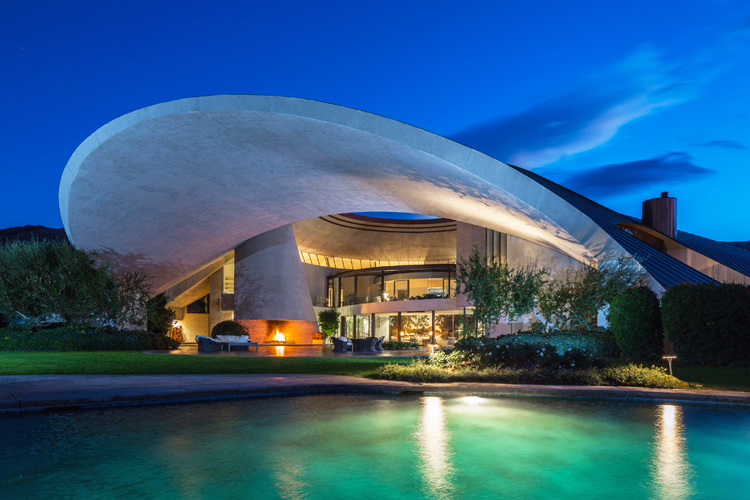 John Lautner, California modernism's architect to the Space Age, has never been one to inspire ambivalence. Now, two of his most famous houses in Southern California are languishing on the market, prompting a new topic for debate. Are sellers seeking $20 million or so for these one-of-a-kind homes just baking pies in the sky, or are they victimized by a naive and unappreciative market? Depends on who you ask. The houses Lautner designed for Dan Stevens (not the actor) in Malibu and entertainer Bob Hope in Palm Springs were both listed for sale in 2013, with the Hope property initially priced at a whopping $50 million. That's less than $25 mil, people! C'mon! "Everything is driven by price," says Patrick Jordan, of Patrick-Stewart Properties, listing agent for the Hope house in the exclusive Southridge community, in a rare admission by agents for such expensive homes. "People don't really understand the sheer volume of the house until they come up here," he says of the home, completed in 1980, which at 23,366 square feet is Lautner's largest. Jordan says he still gets tingles walking around the stunning 6.2-acre property, adding, "You think it would get old but believe me, it hasn't." Lautner actually disassociated himself from the project after Dolores Hope, bob's wife, brought in another designer during construction to change the interior, which sports at least six bedrooms, ten bathrooms, and two Garth Benton murals. This is its first offering since she died in 2011, but it used to entertain up to 300 people for a dinner party each January following the Bob Hope Classic golf tournament. Imagine the ghosts that might haunt this joint. 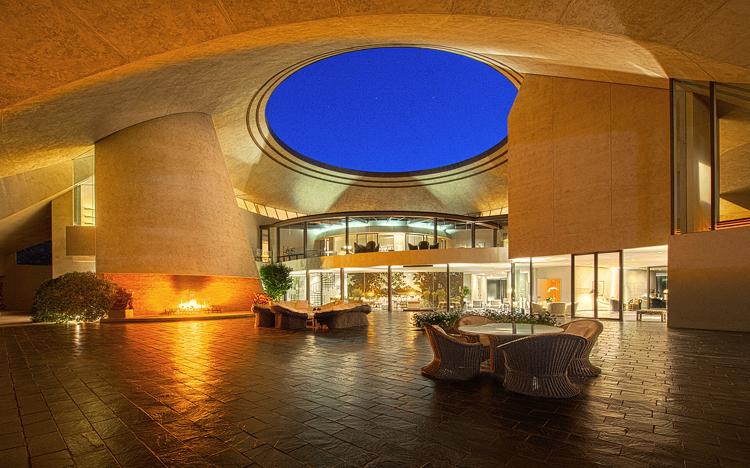 The amazing, wave-like Stevens home was Lautner's first of several in Malibu, and it set the architectural bar tsunami-high in Malibu for decades to come. Its 3,366 square feet has five bedrooms and five baths, was faithfully restored this decade by Modernist home collector Michael LaFetra, and—oh yes—it is fronted by 37 feet of private, sandy beach.